Last season, Hendrick Motosports was able to put all four of their drivers into the Chase for the Sprint Cup so when you think of Hendrick Motorsports, you definitely think of dominance. They’ve been able to handle any and everything that NASCAR has thrown at them, and with a new car and a level playing field, expect HMS to soar back up to the top. 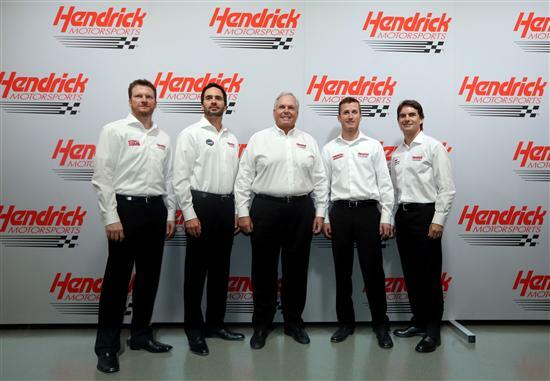 Hendrick Motorsports welcomes all four drivers back this season and to expect anything less than a championship from this great stable of drivers would be absurd. While Kasey Kahne’s first season in the Hendrick stable got off to a rough and frustrating start, he and the No. 5 team were able to turn it around for a career best fourth place in the Chase standings. Heck, Kahne even won his first race of the season in May at the Coca-Cola 600 and followed it up with another win at New Hampshire Motor Speedway in July. Look for Kahne and his crew chief Kenny Francis to do more of the same this season. The two have a great relationship already and if they can avoid the bad luck, they could be a championship contender this season. Speaking of bad luck, Jeff Gordon knows all about it when it came to last season. Gordon struggled off and on during the season, picking up 5 DNF’s along with 2 wins. He barely made the Chase and finished 10th in the standings. Alan Gustafson climbs back on the pit box this season with sponsorship from Dupont(DUH) and AARP Drive to End Hunger on the hood. Expect the No. 24 to bounce back from the bad luck and threat for the title this season. This man will always be a championship contender it seems and he came up short for his 6th title in 2012. Jimmie Johnson won 5 races but struggled at Phoenix and Homestead towards the end of the season. Johnson finished 3rd in points. The struggle of 2012 is still on the forefront of Chad Knaus’ mind and expect him to turn that negative into a positive this season. The news of 2012 season for Dale Earnhardt, Jr. was his win at Michigan International Speedway. If not for the concusion he suffered, the No. 88 could have won another race or two and finished better in the points. Steve Letarte sits back on the box this season and no one has really announced who would be the sponsor for the No. 88 as Diet Mountain Dew announced they’d be scaling back sponsorship for the team this season. National Guard will still be on the hood. Earnhardt is optimistic about what lies ahead in 2013 and ready to get back on track.”I really enjoy being at the track and driving cars,” he said. “It’s been a good year, but this should be par for the course. It’s been a good year, but we want to be a lot better than this. I’m not ready to stop trying to be better.” This could smell great news for fans of the Most Popular Driver!